As Nu Metal has become anything but "nu" over the last twenty-two years since its inception, the genre has suffered steadily from a lack of originality and freshness, and has basically slid to the backburner with a large number of metal fans. Enter: DARK HOUND. This band, hailing from the mighty music spawning ground of Nashville, TN, is a four-piece who definitely have taken notice of Nu Metal's gradual landslide in popularity, and are aiming to revive it one riff at a time. Vocalist and bassist ET Brown displays his unique smooth-yet-aggressive pipes over heavily groove-filled bass lines, while the nicely layered guitar work of Preston Walls and Evan Hensley hit like a hammer against steel, sparking and igniting each track with that old, familiar fire. The drumming by performer Josh Brown is constantly on point, stabbing underneath the melodies like a powerful, fluttering heartbeat filled with anticipation and determination. "Dawning", the bands second full-length effort and third official release, is a refreshing step forward, which brings this fizzling genre back to life with its rich sound and ability to keep the listener captivated and always wanting more. The album's opening track, "Ashes Of Your Worth", is very solid. While most artists use the first song as a little taste of an album's later offerings, (an appetizer before the entree, if you will), DARK HOUND go straight for the jugular at the opening bell. The song opens like crashing thunder, wild guitars screaming like birds of prey in search of the smaller forms of life scampering on the ground in the midst of this raging musical storm. The vocals blend into the music, creating an intense wall of sound. The guitar solo proves relentless as the sweeps move up and down flawlessly, and the drumming throughout is nothing short of phenomenal. This, in my humble opinion, is how nearly all Metal records should start. "Dawning" moves along at a nice, albeit uneven pace, although the term uneven is used in the nicest of ways here. There is variety in this Nu Metal offering, whereas that seems to be an element lacking in the creation of most albums that share said label. Tracks like "Guilt Tripper" and "The Answer" combine attributes of Funk, Thrash, and even Power Pop at times, buzzing through the speakers like a swarm of busy bees. Others, such as "Thrown To The Wolves", bring us back to the glory days of bands like IRON MAIDEN and TESTAMENT, its dark and brooding lyrics sung with evil intensity over a veritable rolling Heavy Metal tidal wave. Not every song on "Dawning" features a proper guitar solo, but the ones that do are just brain-bending at every turn. The lead guitar work is not only exemplary in its talent and execution; it is applied with a level of originality and thought that helps define the very sound of DARK HOUND. Furthermore, I couldn't even begin to imagine the workout that front man ET Brown must endure whilst performing live. The bass playing dances all over the fret board, giving depth and reach simultaneously to every track, and all the while, the velvety vocals slide over it like room temperature butter over a thick slice of bread. The musicianship here is nothing to scoff at and is undeniably ahead of the curve from beginning to end. 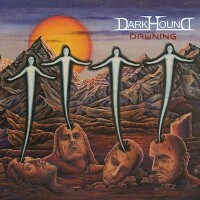 In conclusion, "Dawning" by Nashville artist DARK HOUND is not only a revival of faith for those Nu Metal fans of old who have all but given up on the genre over a decade ago; it provides a little bit of something for everyone who has the time to sit back and enjoy a truly great album in its entirety. Without an inkling of a dull moment, this record rocks at every twist and turn, providing a shining example of what the future of Heavy Metal could and should be. Overall, we have a wonderful and fulfilling listen here, and a sonic promise of greater things to come from DARK HOUND.